Lawyer has a duty to protect your right. Lawyers must zealousy fight on your behalf. Lawyers are clearly sentient to what is warranted when you're being violated, if not? This will be damning to you,everyone. >Investigate properly and timely, such allegation and exert truthful report(s)not illegally altered report to fit their agenda. >Must present all evidence collected,not cherry pick,and then distort the rest,unlawfully to see to it that you're harmed as your child. When all of the above is taking place, you're entitle to sue, as research support for years, per injury/harm you're suffering from. 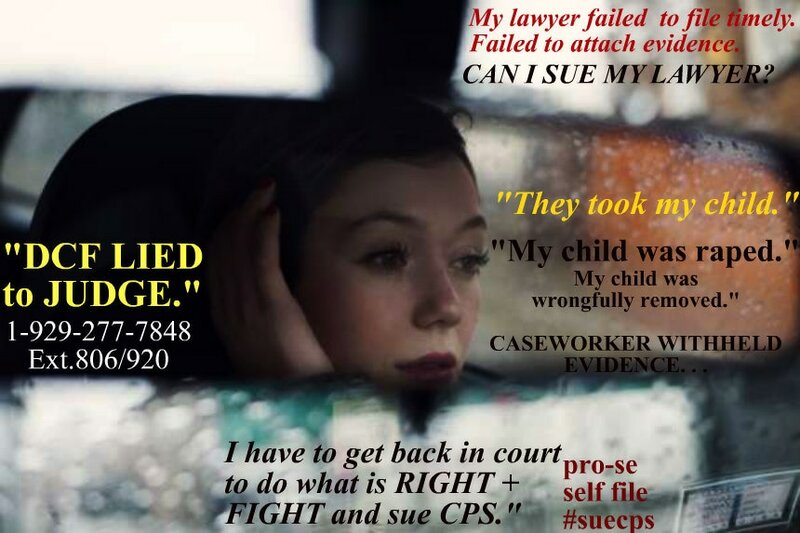 >Suffer without your child, taken from you without proper notice/warning/premised on a false allegation by abhorrent C.P.S. Section 1983, 85,86 et.al., under U.S.C.A.Title 42, for damages also regarding our well-established 14th,4th amendment, and other claims/cause of action for such damges relating to the loss of your own child, and other damages, that you're learning has taken place, while child was forcibly removed from your loving primary residential care. >Attach evidence to your suit/and or custody suit/appeal level suit for justice and you're able to prove such,do not delay." >Did not interview all parties relevant to such lawsuit,but knowingly had information relating to such fact,do not dely." >Did not procure an expert report and or has failed to collect such relevant evidence et.al., be sure to begin today.Do not wait. Whether you're a (good) loving grandparent attempting to sue on her own pro-se self file by deadline, to a loving GOOD parent,aunt,uncle,cousin all who are attempting to sue, YOU CAN DO IT! #LEARN and execute your suit in a timely fashion." Appointment via email shall be sent to you immediate/and or within 1 hr,or so for a same day powerhouse 1-on-1 session on suing by deadline cps worker for the violation of your constitutional/civil rights." Deadlines do exist when suing state employee...1-929-277-7848.